'A.' This back opening design features contrasting yoke and sleeve trim. 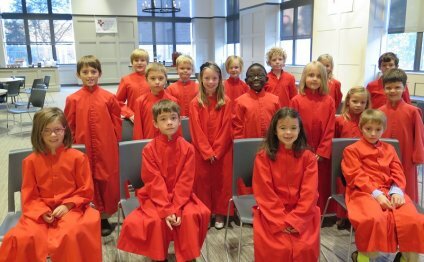 Prices range from $80 to $100* per children's choir robe, depending on fabric choice. And because you are buying direct from the manufacturer, these are lower than some wholesale prices! 'C.' For the youngest kids of your choir, most often worn by ages 4 to 14 but available in sizes to adult. Very easy to maintain. Prices range from $59 to $84* per child, depending on fabric choice, making this an inexpensive choice. 'B.' Available in sizes from about 5 years old to adult, our Sunburst is most often worn by ages 10 through 17. Prices range from $65 to $90* per robe, depending on fabric choice. And don't be fooled by that low price - our fabrics are not cheap, and the robes are high quality!. 'D.' Featuring a built in stole that won't get lost, a high neckline and cuffs to help create a uniform appearance and cover whatever kids wear under their robes. Prices are from $82 to $102* per robe, depending on fabric choice and options.